Stick and Tissue Forum - Spinners. . . yet again! 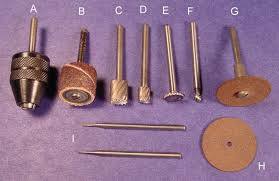 Stick and Tissue Forum › How to build model airplanes › How To Tips and Tricks Articles › Spinners. . . yet again! Excellent. I actually have one of those. I never thought of using it for this purpose. I like it. That should get the hole down to a manageable size. Thanks. Often the nose button is recessed into the nose block to give the spinner a closer fit to the cowling/fuselage nose. The other option if the spinner is deep enough is to recess the rear of the spinner backing plate so the gap is reduced this way. I've used a dremel bit for cutting/sanding disc that used a very small screw that passes through the disc and screws into the bit. This will work on ply up to 1/16" thick. It's the bit labeled "G" in the attached picture! Upper left corner of photo: Spinner sanded and hollowed out. Upper right corner of photo: Wood dowel use as a mandrel and then dug out of shaped spinner so sanding the inside of the spinner could take place. Lower left corner of photo: Now I need a backplate (or base) for the spinner. The one here was made by my some many years ago for the same model. Of course it is does not match the spinner. In order to true up the backplate and right size it, I need to put a mandrel in it. Put it in the drill press and sand away. I have 2 problems with this. 1) Anything I might use as a mandrel requires way too big a hole for the prop shaft. So how do I fill the mandrel hole with something with a properly centered and sized for the prop shaft? 2) lower right corner of photo: Note the Peck thrust button. I’m going to end up with an excessively large gap between the back of the spinner and the nose block. I have seen oodles of photographs over the years of rubber powered models with great looking spinners. What have I missed? I finally got off my duff and used my birthday earlier this month to secure a drill press. That turned out to be an exercise in aggravation. But, today I picked up my Craftsman 10 inch drill press. The end result is a spinner shaped object. This was a potential mold for a tail turret for my son's Privateer. He did not use it as planned so I chucked it into my brand new drill press and went to work. At 71 I have finally gotten the first step in spinner making done. There are still a number of things I have not yet worked out but this is no longer a problem. It did make a nice pile of saw dust but a shop vac took care of that. Gotta get back on that Hurricane. Unless you can control the speed of the dremel tool don't use it to make spinners. I have used my variable speed hand drill for years before I got my drill press. Do this over the trash can because there'll be lots of balsa dust and a vacuum doesn't hurt either. Brass tubing for all bearings much better... You want as close a fit for the music wire to the tube as possible also. Do not use aluminum tubing for the center shaft. Learned that the hard way. Sure it's a wrinkly mess, but it flies. You are on the right track with the drill press, probably a bench type will do the job and turn it fairly slow. Be very cautious with the Dremel, mine is a constant speed and at 18,000 RPM lots of things come loose and move at high speed. Thanks. I'll give it a go before I start the rest of the model. There are several ways to do this. Lots of modelers use a variable speed hand drill. They take a balsa block or laminated block of the proper size in length and diameter of the desired size. You want the grain to run from the base to the tip of the spinner. Cut a female pattern from the plan to check the spinner from time to time for accurate shape. It also helps to cut a ply circle backing plate at the base of the block to be turned. Drill a hole at the center of the block to be turned. If you have a drill press this will assure accuracy of a vertical hole to glue a dowel or if you have an old 1/8" drill bit to glue into the block for turning. Trim off the corners of the block for easier turning. If you have a drill press leave the block on the drill press and use the slow speed if it's variable speed drill press. The ply backing plate will help keep you from sanding the base too small. You'll want to keep the base plate right at the size of the mating surface of the spinner and the fuselage. Start with coarse sandpaper 80 grit or so to ruff in the shape. Then move to the finer grit when you're closer to the exact size you desire. Once you get to the final shape finish off with 400 grit wet/dry sandpaper dry. Remembering to use the female template over the spinner to confirm shape. Once you have the shape you can then soak the glue with acetone to loosen the glue and remove the dowel or drill bit so the spinner can be hollowed out if you're going to use this as the spinner. The other option is use this as a mold for plunge molding or vacuum forming a spinner. Because it's a spinner you'll want to use thicker plastic so it will be more resilient to lawndarting! Here's a quick CAD drawing to assist in the words above. OK, so I need a balsa spinner about 7/8" in diameter and 3/4" long. How does one go about "turning" one? What to use, a Dremel or a electric hand drill. I have considered a drill press. I know that the big, hunky (and the smaller ones) are not designed for side pressure. But, come on, how much damage can I do to one of those by making a spinner now and then? I'm thinking that even if I use my Dremel to "turn" the spinner, somewhere along the line I'll need a drill press anyhow. My main concern with the Dremel is the high RPM. I think I will need some sort of backplate? I have seen a good bit of info on molding one from a balsa plug, and I may do that. But getting the balsa plug is still a bit of a mystery. That is one thing I don't remember Flying Models covering in detail. But I could be wrong.